One thing that Jeff Bezos gets right at Amazon is naming. Look what a powerful name Amazon itself has turned out to be, even though he had lots of pressure to call it something more bookish at the outset. Now they have introduced their revolutionary Kindle eReader… and made Kindle stand for ebooks and not starting flames. After that master stroke, it was but a small step to Kindle Fire for the real version that is setting the world aflame!Such common English words. Such powerful product branding and positioning by using them in a new way. Fabulous. 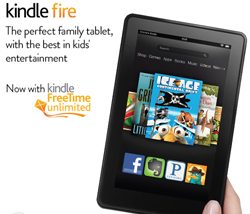 The Kindle Fire logo could be a lot more exciting. On the other hand I think they are not trying to distract from the device and the user experience, so we gave it a decent score anyway.